The torpedo-shaped underwater vehicle will travel through the waters of the western basin of Lake Erie to gather and analyze data on a harmful algal bloom currently occurring in the lake. The tool will also archive samples for later genetic analysis, with the goal of better understanding the growth, toxicity and persistence of harmful algal toxins and developing future mitigation strategies. The team is testing the new technology with the eventual goal that it can be used to improve NOAA’s decision-support tools for Great Lakes communities, including the operational Lake Erie HAB Bulletin that provides an analysis of the bloom and a 3-day forecast, and the experimental Lake Erie HAB Tracker that extends the forecast out to five-days. These tools are used routinely by regional drinking water authorities, state health departments and recreational managers. Scientists and engineers teamed up to adapt a system currently being tested on the West Coast to detect domoic acid, an algal neurotoxin that causes shellfish poisoning in marine waters, for use in tracking harmful algal blooms in freshwater lakes. The unmanned vehicle has been equipped with a 3rd generation environmental sample processor and special sensor to detect microcystin. Microcystin is a toxin produced by cyanobacteria, a blue-green algae that causes severe blooms in the Great Lakes and other freshwater systems. Blooms can grow rapidly and cause harm to animals and humans. Cyanobacterial blooms contribute to economic losses associated with drinking, recreational, and agricultural water resources that exceed $2 billion annually in the United States. Early detection of the toxin helps communities prepare their water treatment intake systems to protect water supplies. Scientists will program the underwater vehicle for its sampling route in advance and then launch it from a small NOAA research vessel. 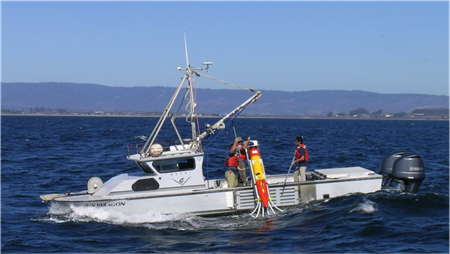 The unmanned vehicle then propels from one station to the next, collects samples, processes them, and measures toxin levels, all while remaining underwater. When the vehicle comes to the surface periodically, it transmits data via satellite to scientists. Additional water samples will be collected and preserved. These samples will be retrieved when the unmanned vehicle is retrieved. Scientists will analyze DNA in the samples to deliver a full catalogue of the organisms present. This information will be compared for samples collected inside and out of the bloom to understand the ecological conditions that control bloom dynamics, with the goal of devising better strategies to mitigate the problem.